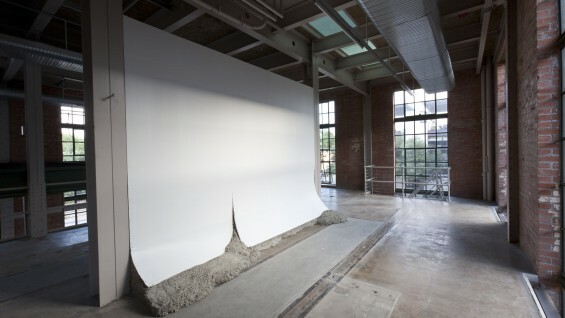 Oscar Tuazon, 'For Hire', 2012, 2012 Whitney Biennial, installation view. Oscar Tuazon’s work frequently reckons with the social registers of art and architecture. In the past he has created concrete structures seemingly tormented by gravity, arrested in mid-collapse or dispersing into debris on gallery floors. Other works have defied the structure of exhibition sites, cutting swiftly through museum walls, not so much inhabiting space as dominating it. His works likewise often challenge viewers as much as they do the spaces where they are displayed: many invite physical touch and use, uncommon modes of spectatorship in the gallery or museum context. While much of the discourse surrounding Tuazon’s work seems to pit his art against architecture, critics like Julian Rose have linked him to the foundations of contemporary architectural theory. Nineteenth century architectural historian Gottfried Semper’s theory of tectonics lay the groundwork for understanding much of the modernist architectural aesthetics as a dramatization of the struggle between form and gravity, Rose argued in the pages of ArtForum, and Tuazon’s work offers a model break from this tradition while avoiding the superficiality of 80s deconstructivist aesthetics. In addition to the theoretical underpinning to his work, the artist likewise has another approach to its making and experience. Tuazon, a 1999 Cooper Union School of Art alumnus, makes art that is often available to touch for viewers—or users, as one may put it. 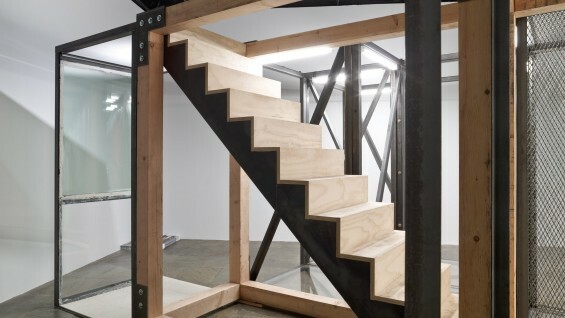 In My Mistake, his 2010 show at London’s Institute for Contemporary Art, he created an elaborate post-and-beam structure from raw, unfinished wood that enacted a serial and repetitive form throughout the space, cutting through gallery walls whereever they met the piece in its stern logic. Both visitors to the exhibition as well as the institutional staff living and working with the piece had to negotiate its incursions on a daily basis. This meant stepping over or onto the beams and adjusting habituated movement patterns throughout the galleries. Oscar Tuazon, Raped Land & The Trees, Illuminations: 54th Venice Biennale, 2011. Last summer in Venice at the 54th Venice Biennale, Tuazon was one of four artists invited by curator Bice Curiger to create what she termed “para-pavillions.” These pavilions functioned as hubs of creative encounter between the show's artists that remained outside of the official and nationally-defined pavilions of the Biennale. Tuazon responded with Raped Land and The Trees—two outdoor concrete structures evocative of Brutalist aesthetics. Raped-Land, an ostentatiously precarious concrete box with space between its constitutive walls, at once inviting and threatening viewers to step inside, functioned as a exhibition platform: painter Ida Ekblad’s mural occupied one of the piece’s exterior walls, while an intermittent sound installation by Asier Mendizabal played inside. Artist Nils Bech also performed at Tuazon’s para-pavillion during the exhibition’s opening days. In this sense Tuazon’s work “works” as an interface between visitors and the other artists, all the while orbiting questions on the utility and context-making power of art. 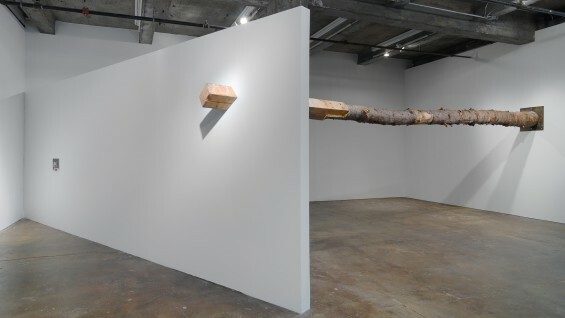 Oscar Tuazon’s latest exhibition in New York is the 2012 Whitney Biennial, curated by Jay Sanders and Elisabeth Sussman, on view through May 27, 2012. Travelling from his home in Paris to Los Angeles in order to fabricate his contribution to the show, the artist agreed to a brief email correspondence anticipating the presentation of this latest work. Bosko Blagojevic: I'm wondering about your plans for the Whitney Biennial, what will you show? 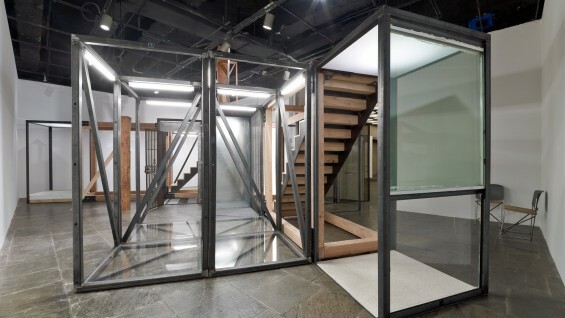 Oscar Tuazon: The piece is a modular system of spaces, a modular building, it's a space for other things to happen. Maybe you could think of it as furniture. Ideally the piece should disappear, it should recede into the background. BB: Someone once said the best technology does this: in use, it disappears. I'm thinking now of the Venice Biennial, the way your para-pavilion interfaced with the work of two other artists. Was this a disappearing piece as well? OT: I hope so—it was a stage for performances, for a poetry reading; it was used as an exhibition space; there was a mural painted on one of the walls. And it provided some shade in an area that got very hot. So people would stop there between looking at art, to rest and talk. If you wanted to experience it as an artwork you could, but it worked just as well as a place to sit and talk. It was a space that encouraged a lot of different uses. BB: When did you first start making art that folded into some concept of "use" like that? OT: I think it actually came from thinking about the political dimension of an artwork—the idea that an artwork can effect some kind of change in the world around it. That was something we discussed a lot in my time at Cooper, I mean that was the sculpture department of Hans Haacke, Niki Logis and Doug Ashford—this kind of incredible and maybe delusional belief in the power of an artwork to do something in the world. That's where my idea of 'utility' comes from. Why shouldn't an artwork be useful? And when you start asking that question, it opens onto some interesting territory because then you start to think about architecture. And when an artist thinks about architecture there's going to be problems, that's inevitable. OT: Architecture has to design around pre-existing conditions, predefined uses. A building needs to respond to the needs of a client. But an artwork needs to invent a use where there wasn't one. Or use things wrong. That's a huge difference I think. I don't know, it's a difference in degree of frustration with the world. But to me it makes sense that artists and architects should have an antagonistic relationship, that kind of argument over how space should be used is productive, and it's maybe what makes Cooper such a funny place—the whole idea that you would have a wood shop shared by artists and architects is actually pretty insane if you think about it, dangerous even. Images courtesy Maccarone Gallery, New York.